Over the holidays at the end of 1992, Lloyd Robinson, the CCD guru at UCO Lick in those days, had just retired and offered to set up a CCD system in the clean room in Santa Cruz to see what could be learned. This star plate was a key component in that original setup. This star plate is an important Kepler relic. It was used in the first laboratory experiments to determine whether CCDs could produce very precise differential photometry. When Jon Jenkins (Co-Investigator and Analysis Lead for Kepler) first set eyes on this plate in June, 2010, he recognized it immediately, even though he had never seen it before. 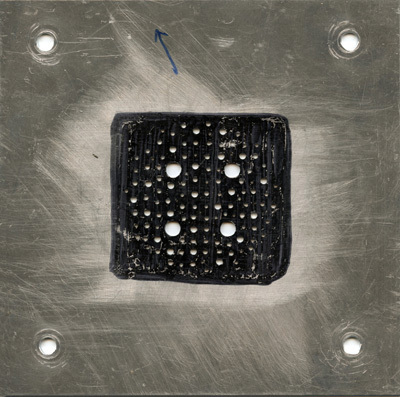 This was because one of his first tasks for the mission was the analysis of an untold number of images from a variety of tests using this plate. These tests were invaluable in discovering all sorts of ways for test setups to go wrong, from sagging light bulb filaments to liquid nitrogen fills. Based on what was learned, more sophisticated laboratory test systems were developed using a variety of other star plates. This painstaking laboratory work culminated in the very successful Kepler Test Demonstration (KTD), which was instrumental in selling the Kepler Mission to NASA. can kepler be reoriented to a different starfield?